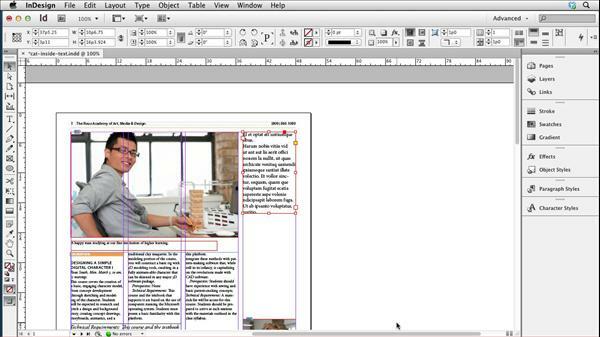 InDesign CS6 is dedicated to improving workflow, document distribution, and flexibility. This course provides in-depth exploration of the new features in InDesign CS6, showing not just where they are and how to use them, but also tips, workarounds, and practical applications of the features. Author Anne-Marie Concepción introduces the Liquid Layout tools and Alternate Layouts for creating flexible layouts for both print and digital publishing; the enhanced tools for creating and updating linked objects within and between documents; the Content Collector and Content Placer tools; and the introduction of EPUB 3. The course also covers creating interactive PDF forms, using the new primary text frame, previewing and exporting color layouts to grayscale, and utilizing the new production aids such as aligning selections to a key object and using smart math in panel fields.